Welcome to Tyson Nails & Spa! 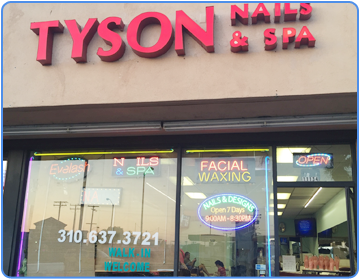 Welcome to Tyson Nails & Spa – the beautiful & cozy place located conveniently in Lynwood, CA 90262. Our team’s mission is to pamper you and our tradition is to exceed your expectations! We are dedicated to find new ways to build new styles with our clients. With years of experience and continuing education, our highly trained staff is ready to serve you and your beauty needs. Our salon offers a multitude of services for valued customers. We take pride in providing the latest styles and techniques in Manicure, Pedicure, Waxing and more. Our staff will create a customized look and deliver just the right service to achieve it. We want to exceed your expectations from the moment you walk through the door! Come and try our services at Tyson Nails & Spa. Copyright Tyson Nails & Spa. All Rights Reserved.